Welcome to It’s Still Me Wig Studio! My name is Jan Strassburg, owner and breast cancer survivor. Losing my trademark auburn curls was a difficult part of my journey. I truly understand the emotional trauma of hair loss. It is my desire to help you emotionally prepare, and to restore your look with a stylish wig. My purpose is to offer hope, help and understanding. 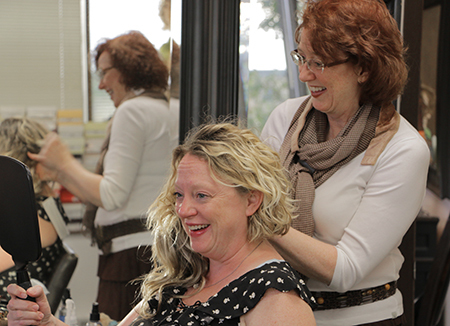 Being located in the Lang Nelson Professional Building at 4601 Excelsior Boulevard in St. Louis Park offers a private studio where women can receive a one-on-one nurturing consultation and find a fashionable wig. A large selection of synthetic and human hair wigs are available as well as styling resources, wig care products, scalp care products and related products, accessories and services. It’s Still Me has the ultimate goal of making the wig journey as manageable as possible. Having experienced what a quality hair piece can do to improve self esteem and preserve a sense of “normality” during difficult times, I wanted all women suffering from hair loss to share my discovery. That’s how It’s Still Me wig studio came to fruition. Shopping for commodities like clothing, makeup, and even jewelry, can easily be done online without customer assistance. On the other hand, when shopping for a high quality hair piece — perhaps the most important fashion accessory you will ever purchase — there is no substitute for a caring, discriminating, and experienced advisor. Having dealt with hair loss first-hand — and having helped thousands of women suffering from alopecia, thinning hair, and chemotherapy-related hair loss — I understand what you are going through. My vocation, and I believe my purpose, is to offer grounded advice while providing the very best hair replacement solutions available to hair loss sufferers. Regardless of your condition, you don’t have to suffer from hair loss. Contact Jan today at (952) 405-8671! Jan was recently interviewed by FOX 9 News. Jan was recently the subject of an article in Sun Newspapers. Jan was recently interviewed by Mall of America PR representative, Erica Dao. It’s Still Me was recently featured on KSTP News. A recent story about It’s Still Me in the Star Tribune. It’s Still Me was recently featured in Twin Cities Business. It’s Still Me receives the Innovative Business of the Year Award from NAWBO. It’s Still Me’s ribbon cutting ceremony and open house. An article about It’s Still Me recently appeared in Lakeshore Weekly News. It’s Still Me was recently featured in the New Member Spotlight section of the Minnesota Cancer Alliance Newsletter (page 4). Thanks to everyone who helped make the It’s Still Me open house and ribbon cutting a success! Toward the end of the event Fox 9 News arrived and filmed a segment which aired April 8th. Watch as Jan presents a selection of wigs on KARE 11 television. Jan tells her story of cancer survival and starting a new business on Fox 9 television news. Jan is interviewed live at the 17th Annual Race for the Cure.